What To Expect: A cult classic that has endured for a reason. Shot in a month on a scant $6 million budget, The Boondock Saints was crafted by a filmmaker who knew how to provide a hell of a lot of fun on a dime. Within the shell of a black comedy, writer-director Troy Duffy has mixed gunfights, the talent of Willem Dafoe, Tarantino-esque dialogue scenes, and a vigilante tale, all of which are complemented by cheeky intelligence and rambunctious humour. Furthermore, The Boondock Saintsis precisely the type of motion picture that will polarise film-watchers: casual movie-goers should gleefully appreciate the fun on offer, while serious cinephiles will likely despise its derivative nature and at times absurd stylisation. This is exemplified in the fact that the movie received a plethora of negative reviews, yet also received a strong cult following. And the cult following is for good reason – this is a gripping, amusing picture. Before proceeding with the review, it’s crucial to note that one’s enjoyment of The Boondock Saints is somewhat dependent on how it’s seen. The best way to view the movie is without any knowledge of the plot or any knowledge of what to expect. While this review avoids spoilers, it’d probably be best to stop reading right now if you haven’t seen the film, and simply go rent it. It’s worth it. 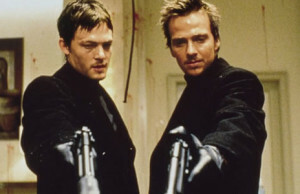 The title of The Boondock Saints refers to the Irish-born McManus brothers: Connor (Sean Patrick Flanery) and Murphy (Norman Reedus). 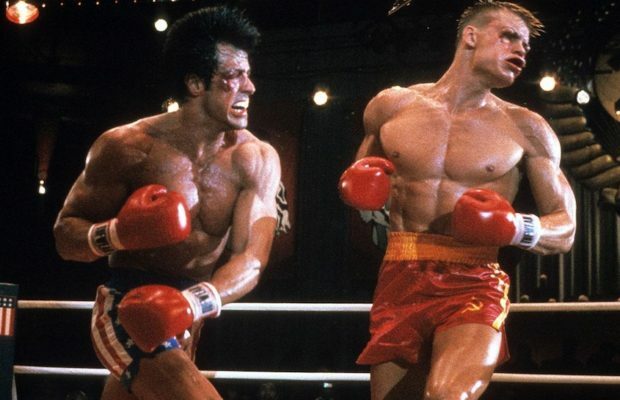 The two reside in Boston, and inadvertently become heroes to the public when, in self-defence, they kill a few small-time hoods from the Russian mob. 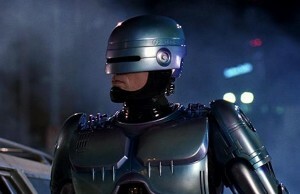 They turn themselves into the local police, but are released without charge after submitting a statement. Realising their actions may prove beneficial for the city, the brothers become vigilantes and begin killing off the city’s less desirable element. Hot on their trail is intelligent, flamboyant FBI agent Paul Smecker (Willem Dafoe). But the closer Smecker grows to catching the now-legendary Boston saints, the more he wonders whether their actions are a work of crime or an act of justice. 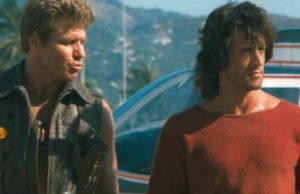 Strangely, the film’s plot is not unlike The Blues Brothers, with the McManus brothers embarking on their mission to slaughter gangsters because they hear a call from God. Added to this, the formula is rather similar to The Blues Brothers: some violence here, a catchy tune there. One of the most successful straight-to-video releases in history, The Boondock Saints suffered a lot of trouble during its hard, long road to the racks of your local Blockbuster. Troy Duffy’s debut was originally planned as a theatrical feature, but nearly collapsed several times before the movie even reached the production stage. Some attribute this to Duffy’s inflated ego, while others say the Weinstein Company and Miramax simply dropped the ball. An account of the sordid behind-the-scenes troubles was told in Overnight; a documentary by filmmakers Mark Brian Smith and Tony Montana. But no matter whose side you’re on, The Boondock Saints was eventually brought to fruition, and most of the cast and crew walked away happy. While the theatrical release was an utter disaster, the low-budget flick made plenty of waves upon its video release in 2000. What truly allows The Boondock Saints to work is that the McManus brothers are a compelling, interesting pair of anti-heroes. Additionally, the movie taps into our secret desire for vigilantism. Who hasn’t thought of how terrific it would be to mow down gangsters in a rain of machine gun bullets? Would anyone grieve the death of murderers? 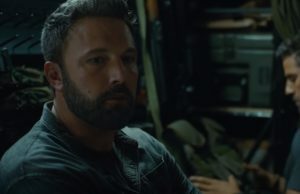 Out of all the aspects that make the film great, the structure is one of the most prominent: crime scenes are shown after-the-fact before a flashback reveals how the killing went down. Another asset is that The Boondock Saints is chock full of hilarious, quotable dialogue. It has its fair share of cartoonish, gratuitous violence as well (including a scene in which a cat is blown to bits by a misfired gunshot), but it’s all in good fun. Unfortunately, Troy Duffy never directed or wrote another movie since The Boondock Saints until a decade later, when the film’s sequel finally got off the ground. Playing the McManus brothers, Sean Patrick Flanery and Norman Reedus are an impeccable duo, and share an extremely convincing camaraderie. They feel like brothers, look like brothers, and act like brothers. They’re wonderful foils for one another as well, with Flanery as the even-tempered brother and Reedus as the gallivanting hot-head. However it’s Willem Dafoe who steals the show as the gay yet masculine FBI investigator; a rigid bloke who listens to classical music at his crime scenes, and disperses cracking one-liners towards those around him. In the supporting cast, David Della Rocco is simply hysterical as “The Funny Man”, otherwise known as Rocco. Duffy named the role after the actor because it was written and tailored specifically for him. Well-known comedian Billy Connolly even appears in a supporting role as a badass, aging hitman. For every bucket of blood spilled, The Boondock Saints offers a pinch of brains. In this way, the film is rather akin to 2008’s In Bruges, as it illustrates a human bond between lethal individuals with a mind for decency. Vigilantism seems to get off a bit easy here, but Duffy adds in as much absurdity, hilarity and iconic posturing for the McManus brothers as he can to alleviate the tone. 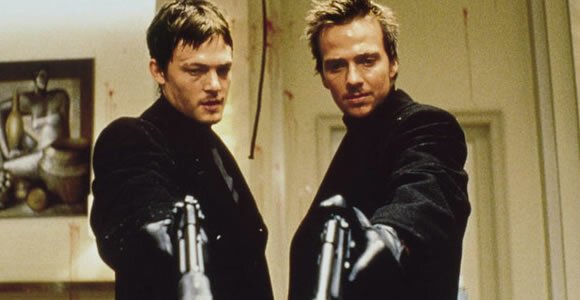 Interestingly, while The Boondock Saints is criticised for being blatantly unoriginal, the fusion of so many unoriginal elements in turn makes it an original creation. The plot is a cross between Death Wish and The Blues Brothers, while the style – particularly in the dialogue – mirrors Quentin Tarantino flicks. This mix is indeed original. It’s fresh blood in the action genre. Overflowing with exciting gunfights and quotable tongue-in-cheek dialogue, The Boondock Saintsis highly enjoyable, to say the least, and it’s doubtful you’ll want to ponder the film’s moral standpoint when it provides such an easy-going, fun 100 minutes.